In 2004, the last Oldsmobile rolled down the assembly line of the old Lansing plant. It was a burgundy Alero sedan, perhaps a shell of the most famous Oldsmobiles built down the same line. The medium-sized sports sedan represented a marque that once stood for automobiles that were bold and powerful. It was the brand that gave you the Rocket V8 and the Hydra-Matic transmission; among many of the innovations Oldsmobile gave the world. An Oldsmobile symbolized what was good about cars built in the good ol’ USA. They were cars that sported affordable luxury graced with touches that appealed to everyone. In the good ol’ days, you can tell the difference between driving a Chevrolet Bel Air and an Oldsmobile 88. You can also sense a special air when you revved up that 455 cubic inch V8 underneath that Cutlass 442 when hunting for Mustangs, Road Runners and Chevelles. Though the Alero had front wheel drive, the smallish Olds would thank its distant cousin, the Toronado, for bringing the driveline to North American manufacturing. This brand has personal significance for me, as Oldsmobile has been my first car and a symbol of luxury for my family. The Blooms had a 1940 Oldsmobile Series 76 when they came across from Cincinnati to Los Angeles. That was the car Mom learned to drive in on the streets of the Fairfax District. They replaced it with a 1950 Series 88. The first Rocket V8 in our family. This talk of Oldsmobile may have you wondering why I would be so fond of it. The brand has been off the General Motors catalog since that last Alero rolled down the assembly line. Yet, it enjoyed success as an American marque of solid automobiles from the first day it emerged from Ransom E. Olds’ own workshop. The company began in 1897, as Olds was tinkering with an automobile that would be practical and easy to drive. The idea was planted by the first successes of Gottlieb Daimler and Karl Benz, there was a race to see which American entity could produce an automobile that equaled Daimler and Benz. Olds went to work on such an automobile, which would spawn the first successful and mass-produced gasoline-fueled automobile – the Curved Dash Oldsmobile. In 1901, Olds produced 425 of these vehicles. That made him one of the first successes in this business on this side of the Atlantic Ocean. From there, Oldsmobile became part of the popular lexicon of America. “In My Merry Oldsmobile” was a huge hit in 1905. It was also sought out by William Durant for inclusion into his new venture called General Motors in 1908. However Mr. Olds would not be a part of the transaction, since a dispute sent him packing in 1904 to start another automobile company – The REO Motor Car Company. Oldsmobile found success within a gap between the budget and mid-priced segments. While the brand aspired to be part of the mid-priced market, there were models that actually were considered bargains in contrast to a Chevrolet or Pontiac. The Series 76 from the late 1930s and early 1940s found buyers that could not really afford a comparable Buick, but would like the performance and additional touches of an Oldsmobile without the “bargain” feel of a Chevrolet. This would be one of the reasons why Oldsmobile was an attractive automobile for my family. Oldsmobile was also an innovative brand. Oldsmobile designed a fully automatic transmission designed for high torque. It was introduced in 1940 showing Americans that the clutch pedal was deemed unnecessary to operate a car. At first, there was some resistance to the Hydramatic transmission, because everyone in this country actually knew how to drive with a clutch pedal before the onset of World War II. During World War II, Oldsmobile and Cadillac worked on a high compression gasoline-fueled V8. The idea was put into play when they created an overhead valve system that was reliable and efficient. With a more effective and efficient valve management system, Oldsmobile was able to raise the compression to improve overall engine performance and reliability. The aptly-named Rocket V8 first made their production appearance on select 1949 Oldsmobiles. The presence of the all-new OHV engine also spelled the end of the F- and L-head engine that sustained the American car since the turn of the 20th Century. By being innovative, Oldsmobile found new customers and the brand was being built on that newfound reputation. Yet, their cars were pawns in the price wars that happened in the USA during the early 1950s. 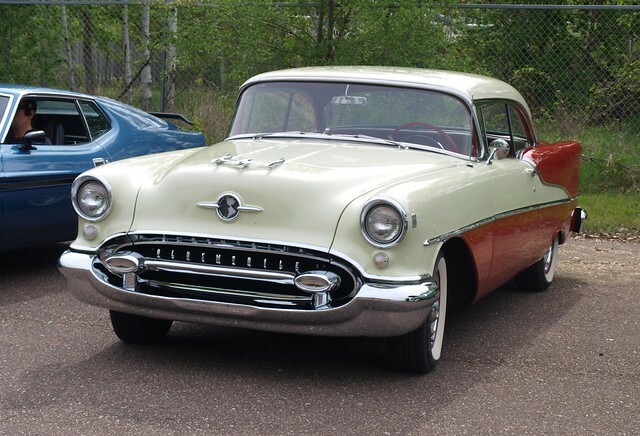 By 1955, Oldsmobile was among one of the top car brands in this country – even though Buick sold more to become number three in sales behind Chevrolet and Ford. There is where the story of Oldsmobile became a part of my own life’s tale. After I was born, Mom drove me home in a 1955 Ninety-Eight Starfire Convertible. Mom bought it used in 1958 and it was gorgeous! The car was a white monochrome paint job with matching white convertible roof and a two-tone leather white and blue ensemble interior. Not many kids can say they were born in such beauty. Perhaps it was a calling for my future. The future of Oldsmobile was indeed brought through the 1960s. The innovation of the Hydramatic transmission and the overhead valve, high compression V8 lent to an expansion of the brand into new segments. When Oldsmobile jumps into a market, they went “all in.” For example, the 1961 F-85 compact featured an aluminum block V8. Oldsmobile created a station wagon with additional aide windows over the second row and cargo hold, called the Vista Cruiser. They also played hard in the muscle car game with the Cutlass 442. Of course, there was the arrival of the 1966 Toronado. The big, front-drive personal luxury coupe showed us the future. It was not because of the continued growth of the personal luxury coupe segment, but the use of front-wheel drive in larger automobiles. Though not a complete innovation – thanks to Auto Union and Cord – but, it would become a standard in GM’s selection of drivelines for the next several decades to come. Oldsmobile found a home in the mid-priced segment. This was because it relied on a pricing strategy that had one foot in the budget brands with more variety of models that were truly luxurious on the top end. 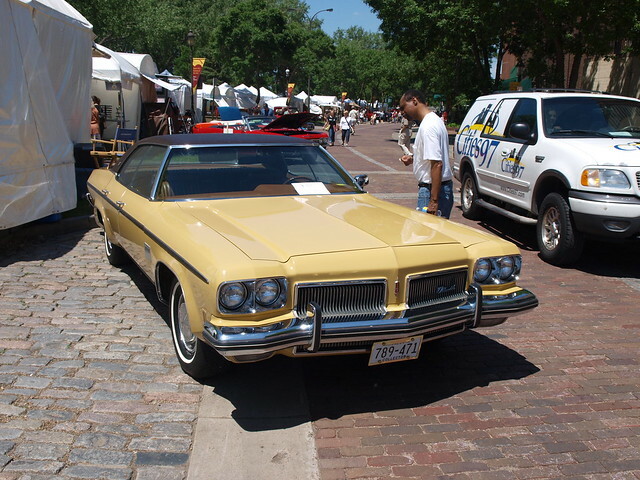 There was no denying the place the Ninety-Eight and Toronado resided – cars that offered luxurious accommodations, but priced below their Buick and Cadillac counterparts. You also found this formula worked well with the Cutlass lineup – especially during the 1970s. In 1972, Dad bought out a lease on a relatively new Ninety-Eight Luxury Sedan. When Dad split, Mom got the car. It suited us fine. In Boy Scouts, while some of the male scouting dads trotted out their old trucks and camper shells, Mom raised the rear end of the Ninety-Eight, had stronger shocks installed and was able to carry seven fully-loaded backpacks in that huge trunk! No joke! It also carried four Boy Scouts in the backseat. Even in the face of the Oil Crisis of the early-to-mid 1970s, Oldsmobile continued to stay strong in the face of such economic adversity. This was when the Cutlass took the lead in USA sales. Cars, such as our 1972 Ninety-Eight Luxury Sedan, were becoming fossils in the face of calls for better efficiency and economy of scale. 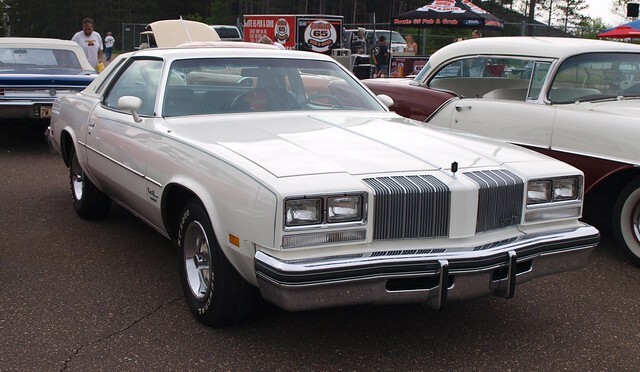 The 1977 full-sized models were downsized to the scale of the contemporary Cutlass lineup. The mid-sized Oldsmobile would be downsized the year after, sharing its size-scale with the smaller Omega, even though it is on its own platform. Even as Oldsmobile began to downsize, some of us were still loyal to the brand with our pre-1977 cars in our possession. Mom’s stroke in 1979 left the Ninety-Eight to my devices. The “cruise missile,” aptly named for its Rocket 455 V8 and the ability to pile in a lot of guys inside of it, became an old lurching monster that took up space at Reseda High’s stadium parking lot. By then, the radiator loved to overheat and a bad tire installation started to rot the lug bolts on one wheel. The huge 15-inch whitewall tires became too expensive to replace. On one fateful January night in 1983, the Ninety-Eight met its ultimate demise. The electrical system simply failed to an unrepairable state. As a community college student working fast food, I no longer had the money to repair the big Olds anymore. It was sold for junk. Some called the quality of most American cars of the 1970s and 1980s “junk.” Oldsmobile was not immune from such criticism. The 1980 Omega was not seen as a bright light for the brand, with the gremlins the X-Body exhibited through its premature launch and poor execution in design and quality. This was also true when Oldsmobile introduced their version of the J-Car – the 1982 Firenza. Vehicles such as these provides customers a quandary. GM used a lot of brand engineering throughout all divisions. They began with a single car and tried to mask the similarities with different front- and rear-ends, interiors, subtle exterior details and even powertrains. A trained eye could tell the difference between a Chevrolet Cavalier and an Oldsmobile Firenza, but there was no mistaking that they came from same body, platform and engine family. It became a game of which brand would you prefer for your J-, A-, X-, N- or any similarly designed car in the GM lineup. My trained eye leaned towards Oldsmobile. When the new front-drive A-Body arrived on the scene for 1982, it would be the Oldsmobile version that would catch my eye the quickest. 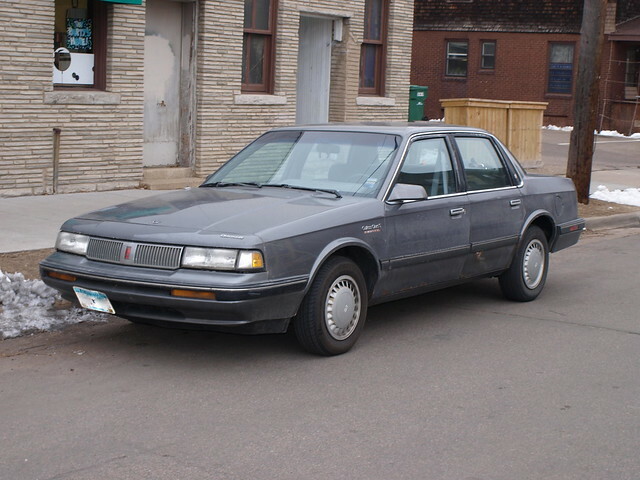 The Cutlass Ciera became the driver for sales throughout the 1980s. It was no perfect, but it was just right for my tastes. It exuded the luxury found on the Ninety-Eight Regency, in a smaller, tauter package. The V6 versions were more desirable, especially when got bigger – and better. Their success would lead to even better vehicles with more advanced designs towards the end of the 1980s. While they sat alongside the showroom with the futuristic looking front-drive 1988 Cutlass Supreme, the Ciera continued to sell at volumes that competed against the newly minted passenger car sales leader, the game-changing Ford Taurus. However, proclaiming one’s self as “not your father’s Oldsmobile” was not enough to see a change in the automotive landscape. By the mid-1990s, neither the Ford Taurus nor the Oldsmobile Cutlass ruled the driveway. North American-built Japanese branded automobiles began to replace domestic brands and products on the sales charts. By the end of the 1990s, the Toyota Camry and Honda Accord would soon supplant the Taurus as the top choice for consumers. They would eventually be superseded by SUVs, crossovers and pickup trucks. Like every automaker in the 1990s, Oldsmobile played in non-passenger car segments. The “dustbuster” Silhouette minivan gave Oldsmobile a premium product to compete with mainstream stalwarts, such as Chrysler’s segment-leading trio from Dodge, Plymouth and Chrysler. The Bravada was a rebadged Chevrolet S-10 Blazer with premium appointments that were needed as the SUV craze was exploding during the decade. If one product was supposed to cement Oldsmobile’s legacy leading to its 100th anniversary, it would be the Aurora. This was the car that would make Oldsmobile traditionalists forget about the Ninety-Eight or Eight-Eight. It was a futuristic design powered by an all-new V8 engine. Everything about the Aurora broke ground – just like the 1949 oOdsmobile lineup did. However, no one was convinced this was the way forward for Oldsmobile. Customers were already dazzled by premium offerings from Germany and Japan. After its 1995 debut, Aurora sales dropped. One wondered if that was the beginning of the end of Oldsmobile. Rather, if that end already began before its debut. Regardless of what was going on at Oldsmobile, my love affair with the brand continued well through the 1980s and 1990s. When I began renting cars – instead of owning them – I had plenty of Oldsmobiles to tool around in. To this date, I have driven an additional 25 Oldsmobiles in my life. This included the Cutlass Supreme coupe with Nevada tags that I trotted from Concord, California to Bremerton, Washington in 1995 to consummate a relationship…that failed. Somehow, an Oldsmobile became a factor in a life event. At least three of them were involved with trips for a movement I started with a generation of young men at that time. One such Achieva sedan, filled with local guys from State College, Pennsylvania, made contact with a bird that got sucked into the opening of an alloy wheel. Somewhere in central Pennsylvania, the story is being retold for the millionth-plus time. It is stories and memories like the Achieva and the bird that kept Oldsmobile in business. They ranged from funny to sentimental and everything in-between. Yet, GM was hoping to keep their loyal Oldsmobile owners and customers fulfilled with new products designed to keep them engaged and connected with the brand. The Alero was one of those products. However, if there was one glimmer of hope before the brand’s eventual demise in 2004, it would have been the Intrigue. It took Aurora-inspired design down to the W-Body, where it replaced the Cutlass and Cutlass Supreme. 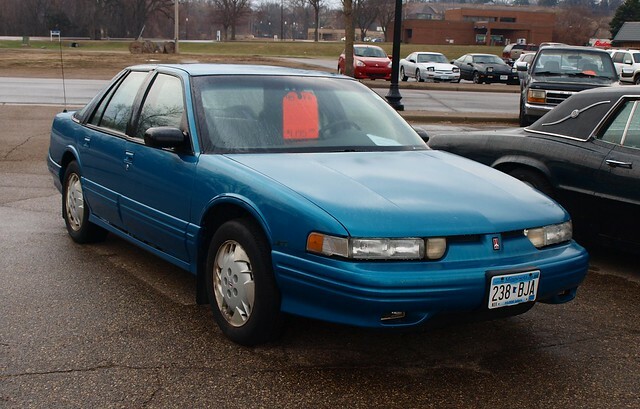 The Intrigue was the last Oldsmobile I truly connected with. It had a great personality, excellent performance and driving dynamics and a sweet cabin. This car should have kept the brand in the game. Sadly, that would not be the case. By 2004, it was over. Oldsmobile was no more. Though it has been 12 years since the close of a great American automobile brand, other domestic and foreign automobiles, SUVs and minivans are trying to do what they can to give you as much of the Oldsmobile legacy now lost in time. Oldsmobile was the benchmark in the middle-priced field for decades. However, it seems that this market lost out to the pressures of the foreign car market, especially those who build in North America. Also lost is the idea that Middle America has to search high and low for a car comparable to an Oldsmobile. As in the end, middle-market brands had to resort to reinvent themselves just to grab a piece of the consumer pool in the automobile market. What are left are the memories. Anyone who owned an Oldsmobile still remembers their ownership experience, good or bad. They had their own stories to tell. This is why the brand remains a legend in American automobiles. There can be no substitute to an Oldsmobile. Not in our lifetime.